Check out all the latest product launches and new treatments in professional beauty, aesthetic beauty, men’s health & beauty, lifestyle & wellbeing. Visit our key exhibitors and gain insight into their new launches on our Beauty Brands Trail. 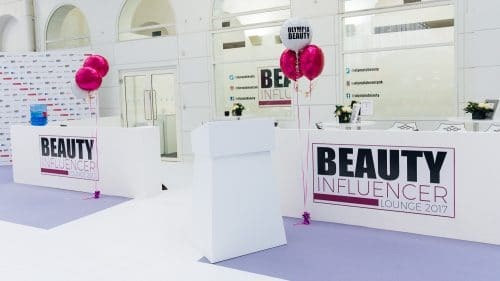 Come and listen to our Beauty Influencers – In Session hosted by some of the top UK beauty influencers and marketing industry experts to gain inspiration and practical advice on all aspects of blogging and vlogging from how to get the best imagery, recording yourself and editing your videos, to working effectively with brands and tips and tricks to expand your influence. Relax in the Beauty Influencer lounge with refreshments on tap, wifi, charging points and quiet areas to blog, vlog, or instagram direct from the event – or simply take a breather. Join us at our Main stage for the Award ceremony of the New Generation Beauty Influencer Awards, which celebrates new emerging talent across beauty and lifestyle blogging, vlogging and social media. Complete your day with a Beauty Influencer Goody Bag containing beauty products from the top exhibitors at Olympia Beauty.